Columbia towers is Seattle's tallest building (The 76 floors). It has one of the best vistas of Seattle from it's observation deck. Our running group has a monthly stair workout which I usually frequent. It provides some variety to my normal running week. Additionally, it works different muscle groups and is definitely beneficial to running. That said I do not consider myself a stair climber or have any urges for stair climbing competitions. Therefore, when a folks from our running group were signing up for the Big Climb (a tower climbing race up the Columbia tower) I was not the least motivated to join them. Then the team captain, Mo insisted that I sign-up. Peer pressure prevailed and I signed up. The race ended up selling out in just under 9 hours. I was very clear about my training priorities. My main training goal for the Winter was the Prague marathon. I would try to get in some stair climbing but that would in no way sacrifice my marathon training. I got in six or so Sunday stair workouts with the group. These would be after my long run on Saturday and therefore on dead legs. All in all, I think these stair workouts benefited my marathon training but the converse was not true. That allowed me the luxury to just run 3 miles each on Friday and Saturday. Our team the SGLRG Stair Crushers were assigned a start time of 12:15 pm. That allowed me the luxury to sleep in. I ran a mile before the climb to warm up. We took some team pics before heading to the 4th floor where we would enter the stair well. The mission: 69 Floors and 1311 steps or 19 steps per floor. We lined up by team in single-file. We kind of self-seeded ourselves in the line. As we were waiting a lady with Lymphoma came down to us and told us that she would not be able to beat the disease but she appreciated that we were supporting this cause... How could we not be touched!! Given that this was my first tower race I did not know what to expect. I had practiced using the railings. I had hoped to mix running up the stairs with walking. I knew that covering 2 stairs at a time while walking took about the same time as running covering just 1 step at a time but more energy. A time of below 12 minutes seemed like it would be good from last year's results and would put me in the top 300-400/6000. The first few folks appeared to be serious stair climbers and that was not me! I ran up the first few steps covering about 5 flights. I then settled into a walk, covering 2 steps with every stride. I did use both railings. There was water about every 15-20 flights. I skipped the water the first time around but did not miss it at the other stations. I later learned that when I felt tired after the first 5 flights, that was a phantom fatigue which I should have pushed through and not settled into walking. While my legs generally felt OK at the end, my lungs burned. I can't remember feeling like this before. The air quality I heard in the stair well tends to be pretty bad so professional stair climbers tend to race with air filtering masks. I guess I wasn't the only one feeling this way. There were other people coughing as well at the finish. I learnt that this coughing is due to a phenomenon known as “Track Hack”. This is when vigorous exercise induces a cough. This cough typically starts within a few minutes of the end of the event, and can last for up to 3 days. It is caused by extreme deep and heavy breathing, combined with an elevated heart rate. The harder you push, the worse it can get, but this gets better with training! This cough happens because your airway becomes irritated and even eroded from the air passing over it with such increased volume and velocity, and some of the small blood vessels can even burst. The airway may also produce phlegm to try to protect and coat itself. This cough is very common in tower running. Most people assume that it is due to poor air quality in the stairwell, or that there is excess dust, but that is not the case. It happens in any air environment, even outside in fresh mountain air. This winter has been amazing mild - warm, dry and sunny. That has made running significantly more enjoyable and easier. However, it's unlikely that you can go through a "proper" marathon training cycle without what I'd like to call "character building" runs. Those runs which make you mentally tough. After all it's this mental toughness which carries you through the final miles of the marathon. Today was such a character building run. I was slated to run my longest run of this training cycle - 22 miles. 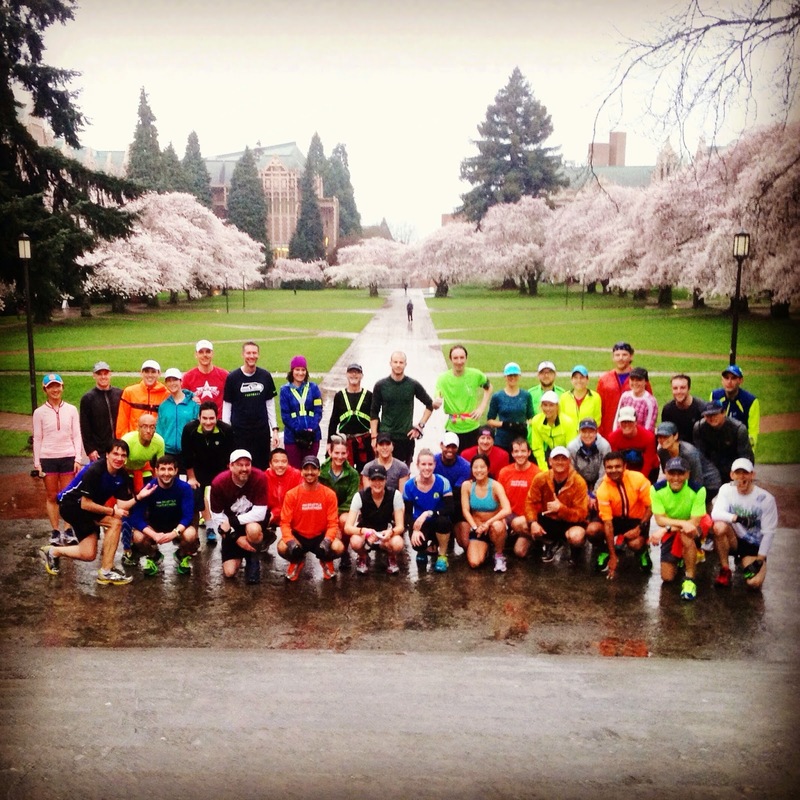 The route was the quintessential six bridges route with a photo stop at the University of Washington where the cherry blossoms are in full bloom this weekend. The weather forecast called for rain and strong winds. There is no way I would have been motivated to wake up at 5:50 am in these conditions and head out without the support of a great running group!